Good lord, I love the colors this time of year. There’s a whole lotta green still, but you turn a corner and WHAM, there’s the most brilliant orange lit up in the crisp sunshine. 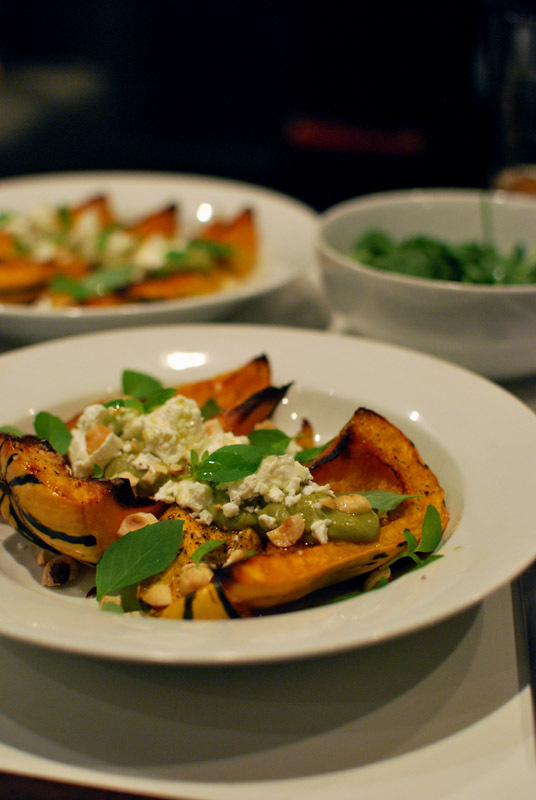 If you happen to get my personal chef newsletter (ahem shameless plug), you saw that I featured pumpkins this month. Such a novel idea this time of year; I’m so innovative. 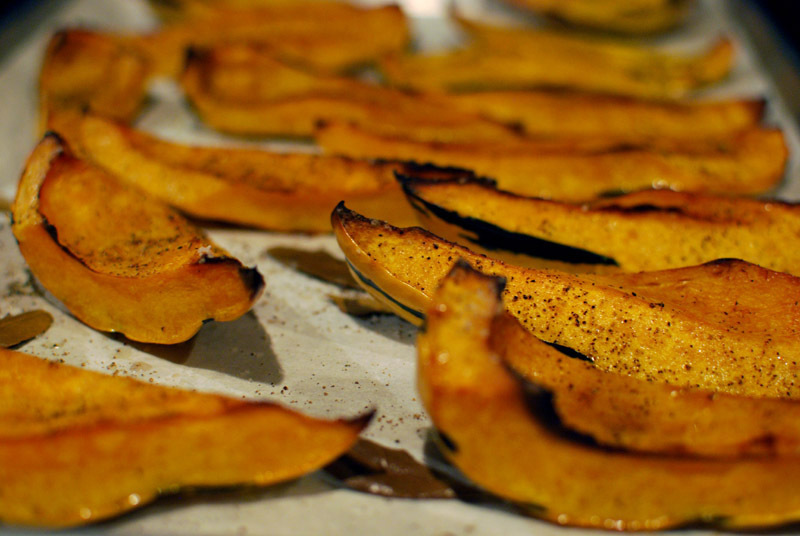 And of course, because I got all into pumpkins, I had to cook some. Running errands yesterday, I happened to park literally across the sidewalk from a small farmers market, where I saw the most adorable little Delicata squash. Kismet. Using the super-simple recipe for Avocado Sauce I recently developed for a client’s dinner party (I can never get enough avocado), the goat cheese still banging around in the fridge, and what I hope isn’t the last of my spicy globe basil, I had a Fall Fantasie on my plate, all orange and green and golden brown. There happened to be both hazelnuts and pumpkin seeds in the pantry, either of which would have been equally good here. I chose hazelnuts because I am a creature of free will, and for no other reason. Yes, I dropped on a few miserly drops of truffle oil. It didn’t need it, but it did gild the lily. This dish is so pretty and so flavorful, I can see a long tray of it served at Thanksgiving, but it’s certainly nutritious enough for everyday dining. Don’t forget to serve it with a little salad and some crusty bread. If you tend to have sensitive skin like I do, you might want to consider donning a pair of rubber or latex gloves while preparing raw winter squash. Delicata might not cause the same reaction, but after cutting a butternut years ago and dealing with "Elmer's glue hands" for a week, I don't take any chances. 1. Preheat oven to 375º F, and position a rack in the middle. 2. Line a baking sheet with parchment paper (optional, but absolutely prevents any sticking). 3. 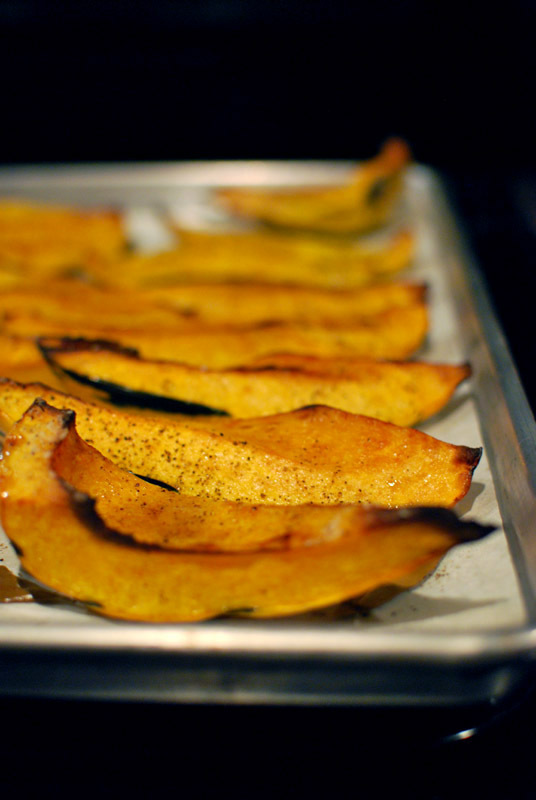 Slice the squash in half lengthwise, and scoop out the seeds (either roast those separately or discard). Halve the squash with a diagonal cut, and then again, cutting each squash into 8 long triangles. You can, of course, cut it any way you like, as long as the pieces are about the same size. 4. Put the squash on the prepared pan, and rub the pieces with the softened bacon fat (or whatever you're using) until evenly coated. Sprinkle generously with salt and black pepper. Scatter the bay leaves around the squash. 5. Roast for 45 to 60 minutes, or until browned on the edges and the flesh is soft (check by piercing with a sharp knife; it should meet no resistance). Let cool slightly. 6. 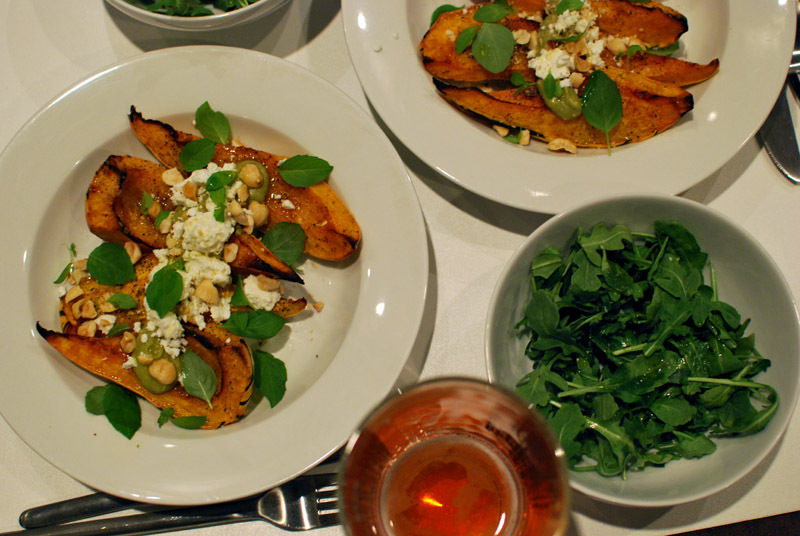 While the squash roasts, prepare the Avocado Sauce, and toast and chop the hazelnuts. 1. Roughly chop the avocado and shallot. Purée with 3 tablespoons of the lemon juice in a small food processor, scraping the sides as needed. 2. While the processor is still running, drizzle in the melted butter. If the sauce looks very thick, add water by tablespoons as needed to thin. 3. The sauce will taste a little flat and tart at this point. Sample it, and add salt, pepper, and/or additional lemon juice to taste. Add a spoonful of crème fraîche or sour cream if you have it, and the mood strikes you. 4. Strain the sauce through a fine mesh sieve to remove any lumps. You may need a spatula to force it through. If making a day or so in advance, cover and refrigerate until ready to use. If you want a warm sauce, or if it becomes too thick in the fridge, gently heat it in a small saucepan over low heat, or in the microwave on short bursts. 1. 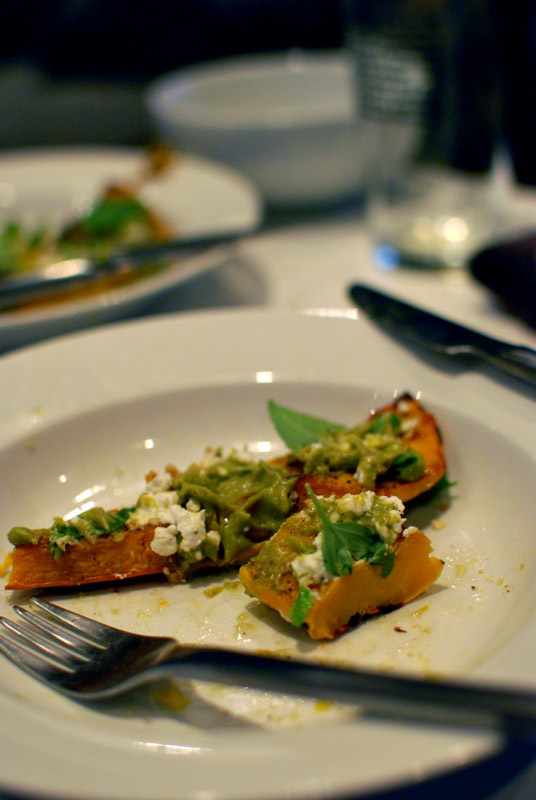 Put a few pieces of squash on a plate. Spoon some avocado sauce over the top, and crumble the goat cheese over that. Scatter the hazelnuts and basil leaves (torn into small pieces if large) around the plate, and drizzle with olive oil if you like. 2. If using truffle oil, carefully drop on a very few drops (only a VERY FEW please!). The focus isn't truffle here, so please use it judiciously. I'm talking 4 or 5 drops on the whole plate. It's potent stuff.